On Monday evening at approximately 8:30PM, a Danville police officer attempted to serve two outstanding warrants on a resident in the 100 block of Berman Drive. The officer went to the door of the wanted person, but there was no answer and he left. As the officer was walking back to his police vehicle, he was surprised by a growling dog running through the yard directly at him from the rear, leaving him with just seconds to consider his options (run for the safety of the police vehicle, attempt to distract the dog from its attack, try to use pepper spray or baton, or use his firearm). As the dog lunged at the officer and attacked him, he was able to draw and fire his weapon once. The bullet struck and killed the dog. What they neglected to add was that the "ferocious" dog the officer killed was an 11-year-old miniature Dachshund, beloved in the neighborhood. 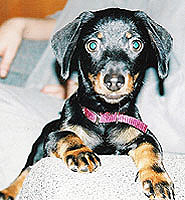 MAY 24, 2004--A New Hampshire woman who apparently did not like her boyfriend's two-year-old dachshund drowned the dog after staging a burglary at the man's home in a bid to cover up the pet's abduction. Erin Wylie, 27, and an accomplice, Shannon Walters, 34, have been charged with breaking into the Kittery, Maine home of Pat Collins, Wylie's boyfriend, Friday night and making off with a computer, a camera, and the dog, named Dewey. Police allege that the two women then returned to Wylie's New Hampshire home, where Walters drowned the dog in her pal's bathtub. Wylie and Walters were nabbed in the parking lot of a Kittery Dairy Queen, where they "were to make arrangements to dispose of" Dewey, police said. The dog's remains were found in the pair's truck. The women have been charged with felony burglary for the Maine break-in and may also face animal cruelty charges in New Hampshire for the drowning of Dewey, who is pictured above. A hungry eagle ate a dachshund, which participated in a rabbit hunt in Sweden. Zoologists warned several days before the incident that unusual cold in Europe might show negative influence of wild animals and birds in terms of their conduct. Scientists said that wild animals might approach towns and smaller settlements in their search for food. No one expected that a hunting dog would fall victim of a hungry bird of Prey. The authorities will pay a compensation to the dog's owner. According to Swedish law, the government is supposed to compensate owners for the loss of their pets, if that loss is caused by bear, wolf, wolverine and eagle attacks. LITTLE ROCK, Arkansas -- A woman's neighbor sold her dachshund puppy at a yard sale for $15 after the dog got out. Dachshund puppies can cost as much as $200, but last Saturday, a couple got a good deal when they bought one for 15 bucks at a yard sale. The problem is the dog didn't belong to the man who sold it. "I know he misses his toys," said the dog's owner Ann Loveless. 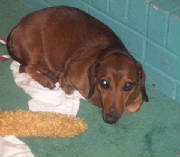 Loveless, like many pet owners, treated her dachshund "Kringle" more like a child than a pet. "When I took a shower, he took a shower," she said. "When I go to bed, he goes to bed. When I get up, he gets up. He's more than just a dog. He is my companion and I love him." So, last Saturday when Kringle got out of his harness and into the streets, Loveless panicked. "I started just driving around the neighborhood," Loveless said. Ann saw a yard sale at a home a block away and asked if anyone there had seen her dog. "And he said, 'Yes, we saw your dog but we have no idea where he is'," Loveless said. Loveless didn't believe the man. That's when police got involved. "And we went down and talked to the people," Officer Todd Winesburg said. "They told us they had seen the dog, that it had run into the yard and out into the street and almost got hit by a car and that was the last time they saw it and they let us into the house to see if the dog was there and it was not." "This is John Johns. ... I need to tell you what happened to your dog." "We put him in the backyard and he was nipping through the fence at our neighbor's dog, and my husband didn't like that and by the time I got out of the shower, he had sold the dog and gave the dog to this lady." Debra Johns said both she and her husband feel terrible about what's happened. "I said John, what you did was wrong, ethically wrong," she said. "[John] said "I want to make restitution." I said, "You can't make restitution. You don't have enough money to make restitution to me," Loveless said. Police said Loveless could press charges but instead she just wants her dog back. "I just want whoever has him," Loveless said. "I'm not gonna ask any questions. I just want them to bring him home, please." The Johns said they're helping put up flyers and traveling around to other yard sales to see if they spot the person they sold the dog to. Loveless and the couple are also offering a $200 reward for Kringle's safe return.